Jennifer’s next two Geffen albums, Say You Love Me and Get Close To My Love yielded the hits “Come Sunday”, “Hard Times For Lovers”, “Say You Love Me”, “Read It In My Eyes”, “Heart On The Line”, “Givin’ Up”, and the ever so danceable “No Frills Love.” Her Say You Love Me album was never released on disc but several of the songs can be found on The Best of Jennifer Holliday which was released in 1996. I just recently purchased her I’m On Your Side album from 1991. No matter the genre, Jennifer brings a lot of power to her music which makes me wonder why her star is not shining brighter. She has done some great TV and theatre roles but nothing has topped her Dreamgirls performance but is that a realistic expectation? It frustrates me when wonderful singers fade away only to be replaced by newcomers who don’t even feel what they are singing. Rant off! Her most recent album, On & On, was a very well produced gospel album released in 1994. In recent years, she has provided her powerhouse vocals to the catchy dance club hits “A Woman’s Got The Power” and “Think It Over.” I look forward to more good music from this Dreamgirl. Enjoy your music. This entry was posted on Friday, January 23rd, 2004 at 6:07 am. 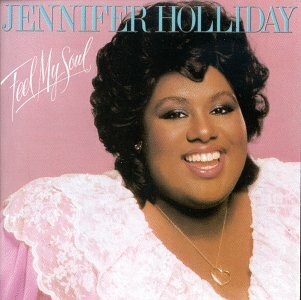 It is filed under Flashback Friday and tagged with Feel My Soul, Flashback Friday, Jennifer Holliday. You can follow any responses to this entry through the RSS 2.0 feed. On TV, she was just as riveting as her voice is. That was a great thing. I look forward to see what music she has in store for us. Jennifer’s humble beginnings are very similar to those of Aretha in that she is the daughter of a Baptist Minister, from the hood and began singing her little gospel solos in the church at an early age. I dare not compare their voices. (You fill in the blanks):) I’m always pleased to see you review fellow Houstonians! Jennifer is another one that does Houston and the State of Texas Proud! Like you, it frustrates me that the powerhouse voices tend to disappear all too soon while the “sound-alike talentless off-key screamer/moaner types” continue to mass produce and thrive. In Jennifer’s case I wonder if it is bad management or simply her personal desire to take a well deserved break from the public eye? The Funk Brothers who were the sound of Motown, were not acknowledged as being the band behind all of the Motown Songs until the movie ‘Standing in the Shadows of Motown’, was created and released….Finally the truth came out and yet years of invisibility were a painful experience for the group. There is a shadow here in regard to Jennifer Holiday as well, even as she has performed for many years and received great attention; to not give recognition to her as a part of this next phase of the Dream Girls into a movie, and then having the audacity to rip off the song in copycat fashion…Well the message in the movie really says it, look to the beauty and don’t give credit to where credit is due, to the real singing talent that is who? Jennifer Holiday in this case. Hudson is talented but sure doesnt come close to having the Gospel Power and emotion that Holiday expresses. It’s Holiday’s song. Perhaps there is the opportunity here for Ms. Holiday to do something new as a comeback using this movie as a stepladder to take it to a whole other level! CORRECTION: The album, “Say You Love Me” was released on CD and is now out-of-print. Does anyone have more information on the CD release of Jennifer Holliday’s Say You Love Me album? I have not seen the disc available anywhere and have heard from big fans that, for one reason or another, it was never released on CD. I would love to get my hands on a used copy if it was in fact issued on CD!